For all your thermal binding needs, ADSS offers a large selection of thermal binding machines, and thermal binding supplies, perfect for creating business proposals, manuals, and school reports that will be bound permanently. 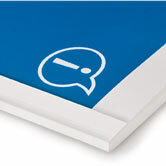 Thermal binding offers a professional binding style and is very simple to use. Thermal binding systems use standard thermal binding covers sets for an invisible glue bind. These systems use a pre-formed wrap-around cover with a thermally activate glue strip in the spine to bind the pages. Simply insert your pages into the cover, place the document into your thermal machine for a professional bind. Perfect for the small or general office, our thermal binding machines are equipped with pre-set binding cycles and adjustable spine widths. Browse our comparison table of thermal binding machines for a helpful reference. Also visit our Binding Machines and Binding Supplies online catalog to find all the supplies and equipment that we offer. We guarantee you won't be disappointed. ADSS also carries thermal bind covers, staples and wire, shrink wrap film rolls and more! This T100 thermal binding system is perfect for creating business proposals, manuals, and even school reports that will be bound permanently. The TB450 Thermal Binder is ideal for heavy duty use in a small office or general office.